During the winter folks watching the Harmar bald eagles’ nest have an added birding bonus. There’s often a peregrine falcon perched at the Allegheny River near the Hulton Bridge. 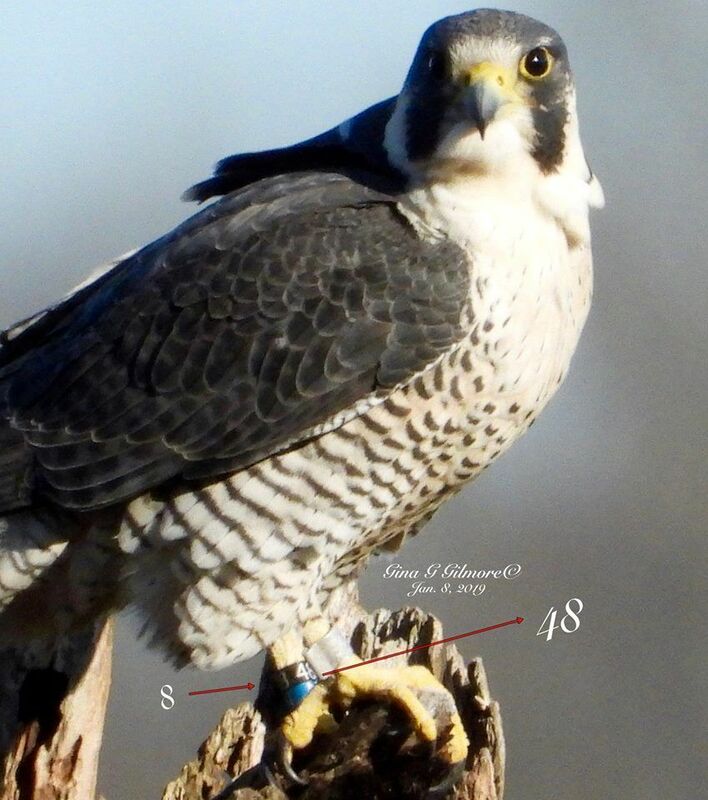 In November 2017 Amy Henrici began seeing a single banded adult peregrine at the Hulton Bridge, but only during the winter. This winter there’s a banded peregrine there again. Gina Gilmore has been taking pictures and Rob Protz has been forwarding her photos to Art McMorris, Peregrine Coordinator for the PA Game Commission. There’s no way to know if this is the same individual as last year but she’s certainly a beautiful bird. Last week Gina got good photographs of the color band showing the number 48 on Black. … and a Blue N.
Because the bird is three years old, this photo of her head and wing coverts is very intriguing. She still has some brown juvenile plumage in her gray wing coverts and juvenile “eyes” on the back of her head. Normally this indicates a two year old bird. 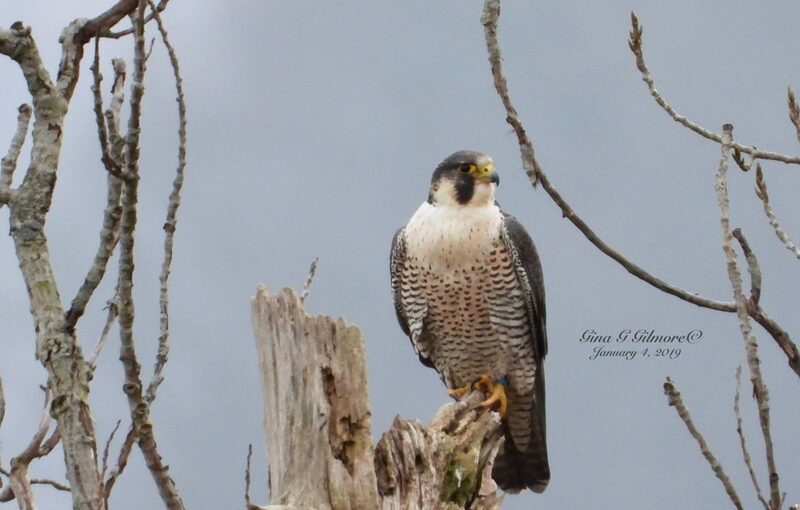 Peregrine fan Kathy Majich of Toronto recognized this plumage quirk. “Ms. Indiana” is one of the last chicks raised by Zeus and Maltese in South Bend before he disappeared during fights with a new male in April 2017. Kathy says she may have inherited the persistent head pattern from her mother. Maltese has it, too. Will she leave in April? Or will a male join her? Wait and see. 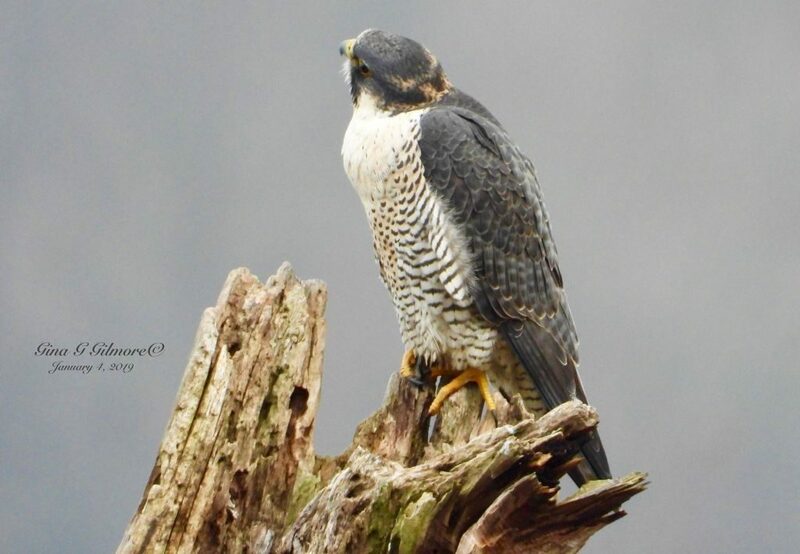 (*) Here’s how peregrines get their names in Pittsburgh. Thank You for being consistent in your love of our Pgh birds and all birds. 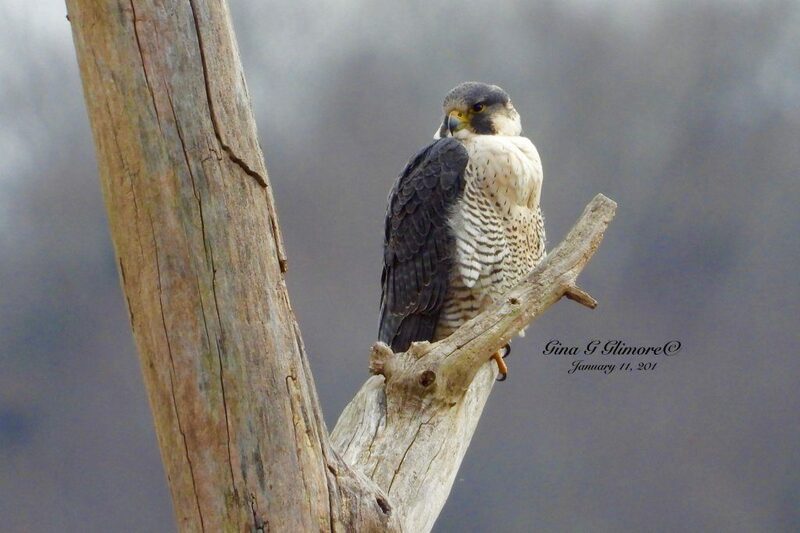 Good photo and thanks to all for being diligent in identifying this gorgeous Falcon. Beautiful bird! Will be interesting to see what occurs on down the line. This is great news. Thank you for sharing it. Does Miss Indiana have a favorite perch and where is the best place to see that perch? Thanks. Betty, most of the people who see this peregrine are parked in this dirt parking lot next to Freeport Rd, northwest end of Hulton Bridge to view the Harmar bald eagles. Wonderful story and beautiful photos of Ms Indiana. Gina, your attention to detail and sharpness of your photos are amazing. Keep up the great work!!! amazing photos of that gorgeous girl. 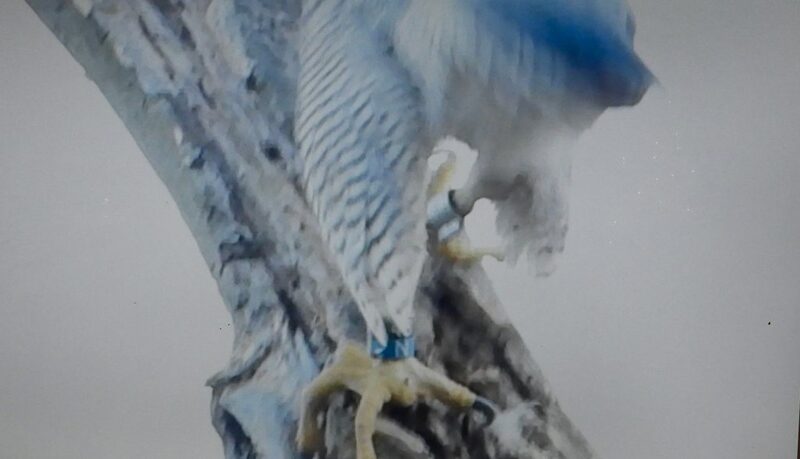 The peregrine watchers in South Bend, Indiana must be thrilled to learn that this female has thrived and survived and has traveled to Pittsburgh. Wonderful photos. Beautiful Ms Indiana ?? Awesome pics Gina!! I so Enjoyed! Love her name?? Wow! Thanks for sharing this. I may have to head over that way some time soon to try and make some photos myself.